With the onset of very hot temperatures increasing the potential for larger fires in Idaho, the wildfire season clearly is under way. 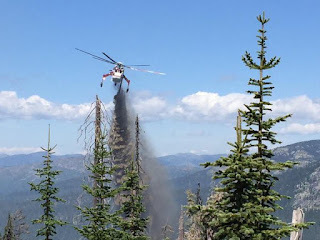 The Idaho Department of Lands (IDL) is finalizing its review for fire season preparedness with all the Idaho Resource Areas and the combinations of suppression resources are ready for the tough months ahead. “Our goal is to take strong aggressive action with new fire starts and keep fires to less than 10 acres on State-protected lands,” State Forester David Groeschl said. IDL protects 6.3 million acres statewide. Almost 200 permanent and seasonal fire personnel are getting prepared for action. The agency has 31 engines, two six-person hand crews, four State Correctional Crews and two helitack crews with statewide responsibility. Groeschl said four Single Engine Air Tankers (SEATS) deployed to McCall, Lewiston and Coeur d’Alene are very effective at aiding initial attack efforts, along with one Amphibious Water Scooper and the availability of Heavy Air Tankers. This year the excellent Rangeland Fire Protection Association program has expanded from six to now eight associations with approximately 250 ranchers trained and ready to provide help with rangeland fires in southern and southeastern Idaho. With the Independence Day holiday approaching, IDL cautioned that fireworks are prohibited on all forest and range lands in Idaho during the closed fire season – May 10 through October 20. Further information is available www.idahofireinfo.com.